Earlier this month I reviewed Inventioneers, which I recommended to children 9+. 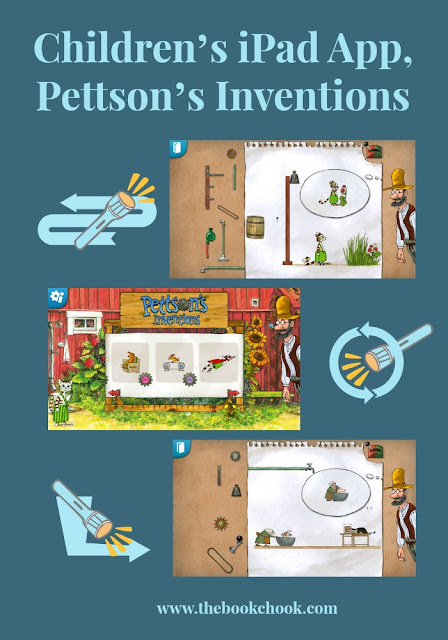 Today’s app, Pettson’s Inventions, is aimed at younger kids. It’s available in iOS and Android and is by the same developer, Filimundus. Help Pettson and Findus build their inventions! In this tricky game you should help building these clever inventions. You need to figure out which ones of the objects should be included and where to put them in the machinery. When the game starts, Pettson speaks to you and promises a prize if you can solve the puzzle. Prizes are virtual cogwheels you can use in inventions. The puzzles, just as in Inventioneers, involve manipulating given objects to solve problems. For instance, mowing a lawn involves releasing a caged “mower” (a very handy bird with a bladed beak!) by attaching a weight to two pulleys. Unlike Inventioneers, the puzzle pieces have one correct place where they can be slotted, and that will be a real help to its target audience. As it was to me! I really liked the fact that the app is FUN. Although kids will be learning to think logically, and encountering physics, there is no overt teaching. I also loved the cartoon-style illustrations which are quirky and colourful. I’ll be adding this app to my list of iPad Puzzle Apps for Kids.